Antigone is the gut-wrenching finale to Sophocles’ soul-and- spirit-wrenching Oedipus trilogy, which details the rise, fall, and inevitable fulfillment of prophecy of Oedipus. Following his timely death in the previous installment, Oedipus at Colonus, his lifelong battle with fate is passed down to his next of kin – sons Eteocles and Polyneices and our titular heroine, daughter Antigone. Their prophecy, foretold by the prophet Teiresias, states that the two brothers will kill each other in a battle for their late father’s seat as the King of Thebes. Antigone returns to Thebes, hoping to halt this prophecy, only to discover her brothers already dead and Polyneice’s body rotting in the town square. 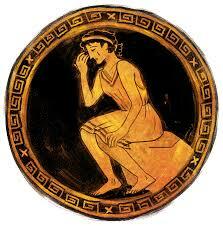 Creon, believing Polyneice a traitor, has made it illegal for him to receive proper burial rites. Refusing to accept Creon’s word as law, Antigone decides to bury her brother, leading to her imprisonment. Knowing she likely faces torture and death, Antigone hangs herself in her cell, defying Creon once again. In the wake of her suicide, Creon’s son (Antigone’s fiance) is stricken by grief and kills himself as well, leaving Creon to end the play in anguish. Antigone is, at its heart, a story of defiance, of civil disobedience, of doing what is morally right in the face of unjust laws. The entire Oedipus trilogy revolves around these themes but the previous two installments focus mainly on the conflict of free will vs. fate (or prophecy). The battles are heady and internal and in many cases a character’s enemy is themselves, or what they may one day be. But Antigone is unique in that the prophecy has been fulfilled before Antigone ever enters Thebes. Her brothers lay dead and the wrong person is in power. So, what is she going to do about it? For once, it is up to her. As long as we as a society have governments and centralized powers, stories of civil disobedience will resonate. We often hear of protests and boycotts, walk-outs and sit-ins; in this Post-Ferguson, Post-Occupy world, people are realizing the power of like-minded groups. But what if you have no group? Antigone stands alone throughout the play. Her family is dead and the city she once called home is against her. She is a young woman fighting for what she knows to be right in a patriarchal society which views her as objectively lesser. It is not an uphill battle; it is a gravity-defying climb up a jagged rock face in a storm. Still she is defiant to her last breath. Antigone is the perfect example of fighting for what is right, of overcoming the odds, of looking fate in the eyes and saying “not today”. Many ancient Greek plays became archaic long ago – but Antigone holds up and speaks as true today as the day it was written.